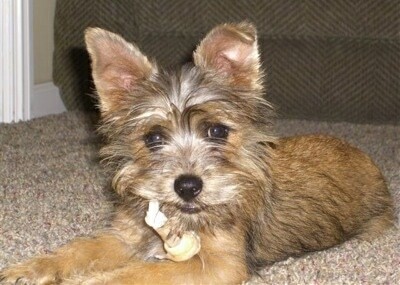 "This is our four-month-old Norwich Terrier / Affenpinscher cross puppy. Both of his parents are champions, with his mother being a Norwich Terrier and his father an Affenpinscher. 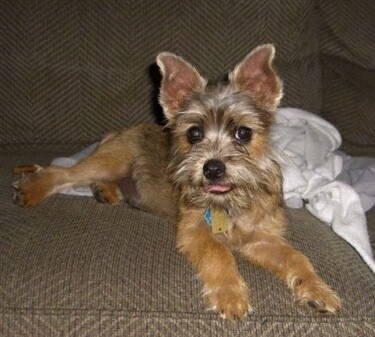 Rudy and his sister were conceived by accident by the breeder but we are so very glad that he was! He is a true treasure and gets along wonderfully with our two-year-old Norfolk. His coloring is remarkable and his inquisitive demeanor even more so!" The Affenwich is not a purebred dog. It is a cross between the Affenpinscher and the Norwich Terrier. The best way to determine the temperament of a mixed breed is to look up all breeds in the cross and know you can get any combination of any of the characteristics found in either breed. Not all of these designer hybrid dogs being bred are 50% purebred to 50% purebred. It is very common for breeders to breed multi-generation crosses.